This volume offers a bracing challenge to the discipline of intellectual history as well as to our own field of U.S. intellectual history, or–more broadly–the history of American thought and culture. The work begins with an introductory essay that convincingly describes what has amounted to a yawning gap—a chasm, practically—in writing on intellectual history, the history of American thought, the history of global thought, not to mention the social history of intellectuals or communities of intellectual discourse. 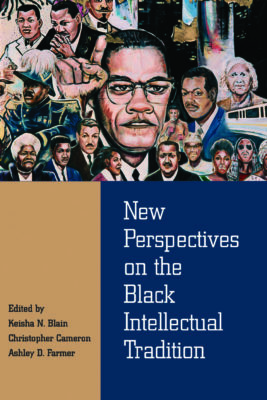 In the literature and in the field–as represented by Hollinger and Capper, or by Worlds of Intellectual History, or by Global Intellectual History, or by American Labyrinth, or, frankly, by this blog–where is a sustained discussion of the ideas and debates that framed or expressed the central concerns and creative interventions of members of various black communities and of the black diaspora in national and international debates? Where is the seriousness of purpose in reckoning with black thought not on the principle of inclusion for inclusion’s sake–or for the sake of our own sense of ourselves as an inclusive field or an inclusive community–but for the simple reason that black intellectual traditions are rich, deep, complex, and constitutive of crucial contributions and challenges to the discourses of modernity? This is the basic gist of the implicit and explicit critique of the introductory essay, whose immediate purpose is of course to explain not only the genesis of the volume but also the need for the particular contribution to the history of thought represented by this collection. If our first impulse is to point to all the ways where we think we are already doing what our colleagues are calling for, then I would suggest we are perhaps not giving due consideration to the scope of their claim: black thought and black thinkers are not peripheral but central to the history of thought and culture in America (and in “America and the world”). To the extent that our field is only tangentially concerned with black thought and black thinkers, we are only tangentially doing our job of illuminating the ideas and arguments that shaped the American past and that limn the horizons of the possible in our discourse today. Certainly, there is visionary new work in American intellectual history that recognizes black thought not as ornamental but essential—I am thinking here, for example, of Lilian Calles Barger’s The World Come of Age: An Intellectual History of Liberation Theology, the worthy subject of an outstanding roundtable we ran here at the blog at the start of this year. But many of us (and I certainly include myself here) are still approaching our projects, from blog posts to books, in an embarrassingly and deleteriously parochial fashion, often seeking an experiential and epistemic diversity of sources only as a belated corrective for a view that we recognize is too white, or too elite, or too heteronormative, too invested in or indebted to the gender norms undergirding the social order. These are perspectival flaws that cannot simply be corrected by adding “diverse” voices or sources. We must go back to the genesis of our projects, to the ways we frame our questions, to the voices we single out from the stream of human thought flowing to us from the past, as well as the voices of scholarly authority and expertise we call upon to lend strength and weight and depth to our own words. In this chapter, Kendi asks us to hear the truth of Black challenges to the self-exculpatory and self-privileging liberalism of such monumental 20th century American thinkers as Ruth Benedict and Gunnar Myrdal. In her 1934 work Patterns of Culture, Kendi argues, Benedict had boldly sketched out a conception of anthropology that was antiracist avant la lettre–for “racism” was a term Benedict herself introduced and then defined in her 1940 work Race: Science and Politics. In Patterns, Benedict had disclaimed notions of cultural hierarchy and of determinative linkages between human biology and cultural distinctions. But in her 1940 work, Benedict defined racism quite narrowly as “an unproved assumption of the biological and perpetual superiority of one human group over another.” Thus, Kendi argues, as long as notions of white superiority were not rooted in biological arguments; as long as they made room for the idea that Blacks could assimilate, adjust, grow, “rise” to the level of educated Northern whites in the U.S.—so long as such conceptions made room for Black “improvement” unbounded by notions of biological limitation, liberals could congratulate themselves for being thoroughly antiracist while at the same time pathologizing Black life and culture. But Kendi’s purpose in inquiry is not anathematize white liberals nor to eulogize black thinkers, but to anatomize and lay bare racist ideas and the anti-racist arguments raised against them. In this schema, Ruth Benedict and E. Franklin Frazier occupy a similar intellectual space, while their contemporary Melville Herskovits developed an explicitly anti-racist conception of the richness, depth and fundamental soundness of Black culture. Gunnar Myrdal, by contrast, though a champion of anti-segregationism and anti-discrimination, argued that Black assimilation to normative white culture was necessary to escape the damage and degradation that had been inflicted upon Black life and that had compromised the soundness of Black culture. The “damage thesis” of Black cultural pathology was rejected by the Black Power movement, most notably by the leading Black Power intellectual Malcolm X. In hashing out his anti-racist philosophy, Malcolm X analyzed racism as a pernicious set of ideas and beliefs, rooted in notions of inferiority, that distorted the perspective of not only whites but also Blacks. The “damage thesis” was an idea that itself did damage, he argued, and as an idea it was something that Blacks as well as whites could mistakenly accept if not embrace. Malcolm’s assessment that racist thinking was no respecter of person was born out, Kendi implies, in the response of the major civil rights organizations to the Moynihan Report. “No major civil rights organization,” Kendi writes, “challenged Moynihan’s descriptions of the pathological black family, of pathological African American culture, of pathological black behaviors, of the emasculating black woman, of the emasculated black man” (165). Our USIH blog colleague Robin Marie Averbeck has written extensively about the damage done by the “damage thesis” in her recent work, Liberalism Is Not Enough: Race and Poverty in Postwar Political Thought. It was not Black liberals, but Black radicals in the Black Power movement who challenged the implicit and explicit racism of the Moynihan report. In response to the rise of Black Power as a challenge to racist assimilationism, liberal assimilationists, black and white, accused the Black Power movement of reverse racism. Kendi notes that Roy Wilkins, the secretary of the NAACP, called the Black Power movement “a reverse of Mississippi, a reverse Hitler, a reverse Ku Klux Klan,” while Vice President Hubert Humphrey argued that “there is no room in America for racism of any color” (166). The Black Power movement and Black radicalism more broadly offered a sustained challenge to assimilationist racism through the push for Black Studies programs and through the work of Black feminist scholars who challenged the racist stereotypes of a pathological and pathologizing Black matriarchy. Liberal thinkers who saw themselves as committed anti-racists because they rejected any arguments about Black inferiority or Black pathology rooted in biology found themselves and their ideas rigorously and angrily challenged by Black thinkers whose interventions shaped and continue to shape the contested discourse of race within and beyond the academy to this day. Kendi’s chapter in this volume speaks a hard word to many of us, and in many registers. The desire to excuse, to exculpate, or at least to deeply empathize with a surprised Moynihan or a shocked Herbert Aptheker runs strong in many of us well-intentioned white liberal thinkers. Both of those men were quite certain they were not racist in their thinking, and yet their Black interlocutors challenged the racism of their thoughts. But they didn’t mean to be racist, we might say; that wasn’t their intent. And in that defense of Moynihan or Aptheker–the defense that they “meant well”–is a defense of the ways in which we too “mean well.” How will we survive “call out culture,” some contemporary writers wonder? What will happen to The Discourse if there is no room for error, no willingness to show grace? But often the “we” doing the asking of such anguished questions is closely identified with the “we” who are in need of grace and forbearance from our interlocutors because we do not even recognize the perniciousness of some of our pet ideas. Sometimes what we need, though, is the searing grace of sheer honesty. As the Apostle Paul wrote to the Corinthians, “Have I become your enemy because I told you the truth?” Perish the thought; truth is the one thing we should always be able to expect from our friends. How wonderful that our friends at the African American Intellectual History Society have put together an anthology rich with truth well told. I commend it to all of our readers. Thanks so much for fixing our attention on Dr. Kendi’s essay. You’ve left me thinking about how we might analyze “well-meaning” liberals’ defensiveness itself in terms of assimilationist racist ideas. First, in the sense that the “I meant well” rejoinder implies that the fault is in the understanding of the person who has “taken offense,” but also in the sense that “meaning well” is itself understood as a kind of etiquette. There are of course excellent critiques of the way that civility and respectability have long been used to police radical Black truth-telling, but alongside that I think we might also think about “meaning well” as finding its purpose not in some kind of positive goal (like finding or hearing truth) but in a negative one. “Meaning well” might be though of as a kind of language game whose purpose is the avoidance of being called racist (or sexist, or ableist, or trans- or homophobic). And the complaint/defense “I meant well,” then, could better be understood as an attempt to cajole the person who has “taken offense” into playing that game–the new goal becomes assimilating the interlocutor into the game of “meaning well,” of helping the first person avoid being called racist. I’m just thinking out loud here, but thank you for so clearly presenting these important ideas. This is not a criticism of Kendi, whom I haven’t read, but just to note that the 20th-century white proponents of the “damage thesis” were, in a way, echoing concerns long expressed by whites (and maybe some blacks, too, I’m not sure) about the possible effects of slavery on the slaves. Those concerns no doubt were often both groundless and/or racist, rooted as they sometimes were in 19th-century tropes about “civilizing” the putatively non-civilized or under-civilized and ignoring the resilience of slaves under slavery and their forms of indirect or other resistance. But if the concerns were groundless and/or racist, that doesn’t mean they were totally illogical — if slavery was held, accurately, to be a damaging and degrading system, then it was not totally crazy to think that something important, or held to be so according to prevailing norms, might have been damaged, even if that thought was in some way racist and/or patronizing, etc. As for every form of assimilationist discourse being racist, that is not something I find intuitively obvious, though I might be convinced that it’s correct if/when I get around to reading Stamped from the Beginning.